I made this cloths hanger cover from the pattern posted at Crafty Gardener. It's a very simple pattern and can be found several places. 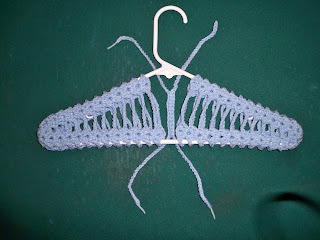 But I have changed the method for attaching it to the hanger. Doing it this way allows you to easily remove the cover if the hanger breaks or as I intend; sell the covers for PPL to put on their own hangers. We all have plenty of hangers and it makes no sense to me to buy new plastic hangers that have covers on them when we generally have our own perfectly fine hangers to put the covers on. Also when joining the rounds after ss to the starting chain I also did another ss in the next stitch and then into the shell opening. this keeps the shells looking the same. if you just ss into the starting chain and then the opening your edging on your shells will be lost and look more like a flat line where it joins. So this is my joining method. You can click on the photos for larger images. Make a chain that is 65 stitches long and fasten off. Make another chain 26 stitches long and then SC into the 26th stitch of the previous chain and SC for a total of 13 stitches then chain 26 stitches and fasten off. It should look like the tie in this photo. 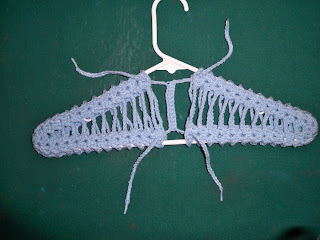 Now slip each half of the hanger cover onto your hanger and place the tie behind the hanger as shown. Now feed each tie from the back to the front through the ch1 space on each shell on all 4 corners. Pull tight and tie together into bows on the top and bottom. Now if anything were to ever happen to the hangers you can easily untie the bows and slip the cover onto a new hanger! What a super ideal... like how you put this together. 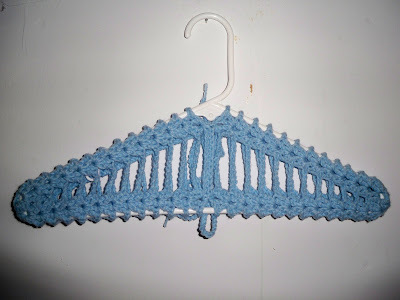 I make small hangers for baby shower gifts, to go with a blanket I make. I don't have this pattern. Thanks. This is a fun one because it works up so fast as it's only 13 rounds per side and almost all chains. 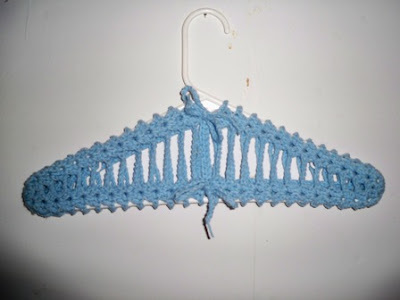 In a lighter weight yarn this would be perfect for baby/kids hangers as well. Link is now updated both places. Hi Rachel - I went to the new link and to Ravelry. I get to the page, but can't figure out how to get the pattern. I tried posting a comment on the page, but no reply thus far. 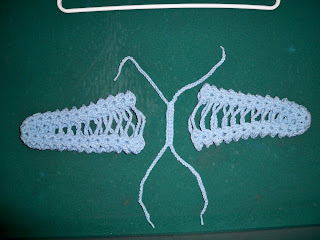 Could you help me figure out how to get this pattern? Many, many thanks! Thank you for letting me know, and sorry for the wrong link. I must have had the wrong thing on the clipboard when I pasted the new link. I updated it and checked it. So if you click on the crafty gardener link at the top of the post it will take you to the pattern page.